It looks like if Newcastle United can make it successfully through the Norwich match then the forecast is looking that bit brighter. Missing key players so early in the season has made things difficult for Alan Pardew as he juggles his limited frontline players, as reported in the Chronicle today though things look to be on the up. “Cheick is training today, Papiss will train too. Colo is coming back and will train on Monday, suddenly things are looking a lot better. Colo is definitely out of the Norwich game, I’m not sure about either Tiote or Papiss yet”. Providing there are no setbacks it looks as though Coloccini should be available for Reading away next weekend with the Capital One cup-tie on Wednesday probably coming too early. 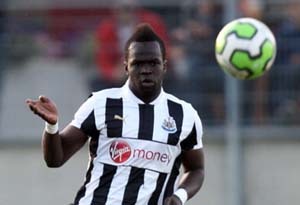 If I was having to guess, I would say it is more likely that Cisse will have recovered from illness and be available for Sunday’s match against Norwich, as Tiote’s absence bears all the hallmarks of last season when he had an injury that always had him possibly ready for next week and then the next one after that. I suppose Alan Pardew has the option of possibly pairing Ba and Shola up, although it wouldn’t be my choice as I believe we need all our likely goalscorers on the pitch where possible. If Papiss hasn’t fully recovered though then maybe he could start from the bench. A win against Norwich would make the outlook that much brighter as it would then make the point at Everton really mean something.